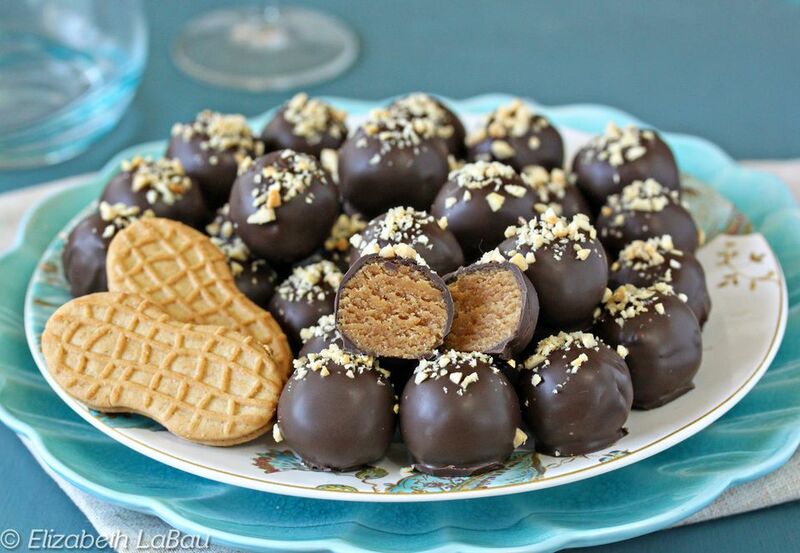 Turn Nutter Butter cookies into delicious truffles! You need only a few ingredients to make these easy peanut butter candies. Dip them in chocolate and top them with a big pinch of peanuts for an irresistible sweet and salty treat. Love making candy from cookies? Try my recipes for Oreo Truffles, Snickerdoodle Truffles, or Chocolate Chip Cookie Truffles as well! Place the cookies in a food processor and pulse them until they are fine crumbs. If you don't have a food processor, place the cookies in a large zip-top plastic bag, and use a rolling pin to crush them into fine crumbs. Transfer the cookie crumbs to a large bowl. Add the softened cream cheese and peanut butter, and stir with a spoon until the mixture is smooth, without any dry patches. It should be easy to mold into balls, but not too sticky or wet. Use a small candy scoop or a teaspoon to shape the candy mixture into small 1-inch balls. Roll them between your hands to get them perfectly round, and place them on a cookie sheet covered with parchment or waxed paper. Refrigerate the tray for at least an hour to firm up the Nutter Butter truffles before dipping them. After the candy centers have chilled, place the chocolate candy coating in a microwave-safe bowl and microwave it until melted, stirring after every 30 seconds to prevent overheating. Using dipping tools or a fork, dip each peanut ball in the chocolate candy coating and place it back on the baking sheet. Sprinkle a big pinch of chopped peanuts on top of each truffle while the chocolate is still wet. Repeat until all of the truffles are dipped and decorated. Refrigerate the truffles to set the chocolate for about 20 minutes. Store Nutter Butter Truffles in an airtight container in the refrigerator for up to two weeks. For the best taste and texture, let them come to room temperature before serving. Click Here to View All Peanut Candy Recipes!